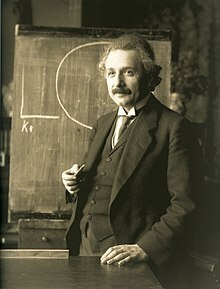 I came across an article yesterday about the auction of Einstein’s handwritten note that recently sold for $1.56 Million. It seems that during Einstein’s trip to Japan in 1922 to receive the Nobel Prize in physics, he wrote notes on how to live a fulfilling life while staying at the Imperial Hotel in Tokyo. When a messenger delivered something to his room, the German-born physicist gave him two of the autographed notes, because he didn’t have a tip available. Einstein said the notes could be worth more than a tip one day. He was right. A calm and modest life is not that easy. St. Augustine said, “Complete abstinence is easier than perfect moderation.” I think that is the case even more so in today’s times where a calm and modest life might be seen as failure. Do you think Einstein is saying not to seek success? He certainly would be considered successful, after all he was receiving the Nobel prize when he wrote this famous note. Maybe we should view his words as a lament. Success is not always all it is caught up to be. Maybe I should spend at least as much time pursuing calm and modest, as much as I do success. There must be a balance out there. What do you think? Previous Post: Are You Prejudiced?